With a 100kg breaking strain on both the cam and the material, Kooloop offers safe and secure restraint that locks both ways, with a fast and easy quick release and a one size collar fits all with one easy touch to secure. Love your dog and enjoy peace of mind with a Kooloop Multi-Fit Collar. Kooloop Dog Collar Offers pet owner multiple features! Small to extra large dogs. Simply adjust as they grow. The double cam lock is revolutionary in it’s design for not only it's strength in restraint, but safety in the functionality for its ONE TOUCH push control. This one lock does three times the work with very little effort. EASY FAST FIT, ADJUSTABLE TO 1mm, QUICK RELEASE, BREAKAWAY & TESTED TO 100KG RESTRAINT. 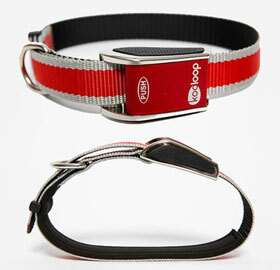 WIN 62cm Multi-fit Collar for Medium to Large Dogs from KOOLOOP DOG COLLARS! No more worrying about collar size. Adjustable by 1 mm increments to grow with your puppy to adult. What type/brand of collar does your dog currently wear? Where did you buy your current dog collar? The winner will receive a 62cm Multi-fit Collar for Medium to Large Dogs. 20 June 2018 Entries drawn. The draw will take place at The Pet Directory at 10.00am AEST. 59-65 Tintenbar Road, Rushforth, NSW 2460 and winners will be notified by phone and email. Winners names will be published on www.petdirectory.com.au on the competition page. The Promoter’s decision is final and no correspondence will be entered into. Competition open to Australian residents 18 and over only. *There are currently 574 people online.